Snowshoe Hare hunting in Maine is a sport all ages can enjoy. The action-packed excitement of a group of hunters awaiting the beagles to circle the Hare builds memories you won’t soon forget. Snowshoe Hare season runs from October 1st-March 31 and can be hunted on a Maine Small Game License. The daily limit is 4 Snowshoe Hare per person. Our hunts are done over our well-trained beagles or feel free to bring your own. The day of hunting begins around 7am when we head to our hunting area for the day. Once all our beagles are equipped with a GPS collar we turn them loose and let the fun begin. After the beagles jump a Hare we will get the hunters in position for the shot as the Hare circles. Be ready with the gun because they are fast! If the Hare gets by us, no big deal, we will sit tight and listen to the beagles as they circle right back shortly! Our area of the State is full of overgrown forest harvest areas that provide perfect cover for the snowshoe hare. Much of the forested areas of eastern Maine have been logged over many decades. These areas are thickly covered with small fir, spruce and cedar. Perfect habitat for the Snowshoe Hare!! Throughout these dense softwood thickets, you will find a network of logging roads and trails, which make great places to wait and get a shot at the fast Hares as they circle. At lunch time we take a brief break for a tailgate lunch and hot coffee and switch out to some fresh hounds for the afternoon hunt. The afternoon hunt will wrap up around 3pm when we start to gather up the hounds and head for the truck. Snowshoe hare hunting is a great winter activity for family or friends. We offer group rates and encourage guests to come with their friends, family or co-workers. Group Rate pricing is available for these hunts so feel free to contact us for a price for your group! For more information about nearby lodging please see our Lodging & Accommodations page. For rates, available options and booking information please see our Guided Trip Rates page. Hunting license not included and can be purchased from Maine Inland Fisheries & Wildlife. 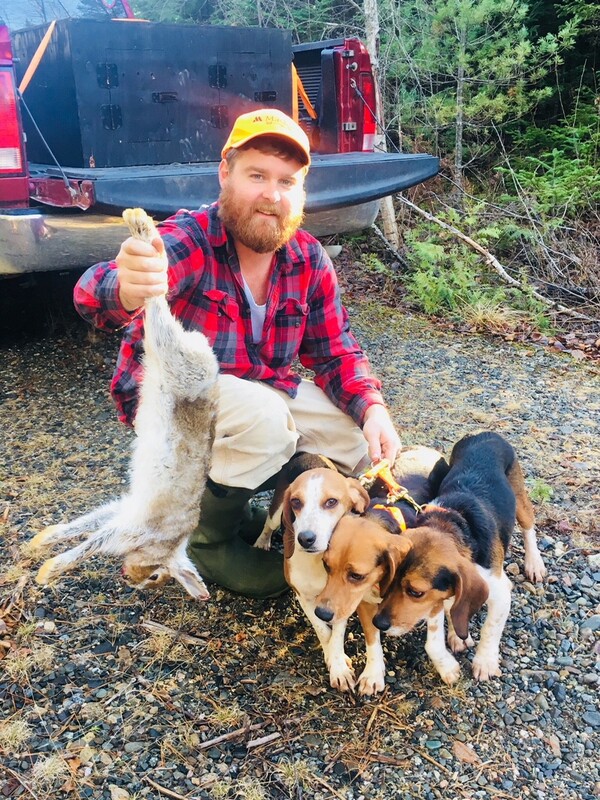 Come experience exciting Snowshoe Hare Hunting at its finest in the beautiful remote Downeast Maine with us at Hunt East Adventures! We look forward to spending time with you!